For many small rural towns, the grocery store is central to the community. It’s not just quick, nearby access to food, it also serves as a community hub, a “third place” for people to gather between home and work. Demographic changes in Greater Minnesota have been hard on local grocery stores, however. 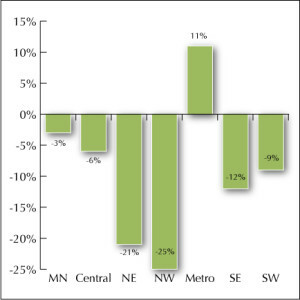 Between 2000 and 2013, Greater Minnesota lost 14% of its grocery stores. The Center has put together a two-page fact sheet looking at some of the reasons and some potential solutions. Declining population means fewer customers. The owner may want or need to sell the store but has no buyers. Comparatively small volume and an energy-hungry business make it difficult for small stores to offer prices that can compete with newer, high-volume stores in population centers. Many people work in these population centers and pick up their groceries before going home. Others are simply willing to drive a greater distance for more variety and lower costs. How are people getting their groceries now? Shoppers drive to large stores in the closest population center. For some, that drive is now 30 miles or more, which can mean as few as one trip a month, limiting their ability to buy perishables. Convenience stores are increasingly becoming the only place in town to buy groceries. People without a car or who can’t drive, namely seniors, people with disabilities, and low-income, are especially affected. They must depend on others for rides or to pick their food up for them. Our research uncovered a number of ideas to help people access fresh food in their communities. ➤ Smaller, multi-purpose grocery store. For example, incorporating the community center, coffee shop or other gathering place into the store. ➤ Keeping overhead low. The grocery business is energy intensive because of refrigeration. New equipment and new buildings are much more efficient. Ways to fund upgrades include grants, low-interest loans or even crowd funding. On the wholesale side, is it possible to combine orders with nearby stores, schools, or nursing homes to lower costs? ➤ New customers. Immigrants and minorities in rural communities offer a customer base that may be overlooked, says Bruce Schwartau of the U of M Extension. Ask them what foods they would like to buy locally. ➤ Convenience stores. Around the country, rural and urban convenience stores have been adding produce and other fresh food. A campaign in West Virginia encourages convenience stores to offer healthier options. In Minnesota, Kwik Trip is expanding its grocery line. Prices may be somewhat higher, but could be offset by savings in gas and travel time. ➤ Drop-off solutions. Buying clubs around Minnesota allow members to order food online, then pick it up at a central drop-off point in town. Food shelves in St. Cloud, North Dakota, and upstate New York also deliver to central pick-up points in low-income neighborhoods. Can a similar model be adapted to deliver groceries to small towns, which are really just neighborhoods separated by large distances? ➤ Farmers markets and CSAs. Communities around the country are working to connect farmers directly to consumers. A year-round farmers market in Alexandria lets customers order directly from farmers online, as does an organization in Troy, NY.